A barbecue grilling center transforms the ordinary backyard cookout into an extraordinary event. 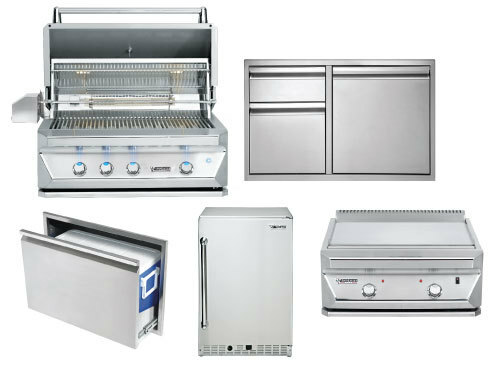 See why America's Leading Builders use us for all their outdoor kitchen appliance and storage needs. Custom Outdoor Kitchens & Grill Islands On-site or Delivered. Our Custom Built To Order (PREFAB) are available anywhere in the Continental US. We have created thousands of Outdoor Kitchens! We are the experts in the BBQ Grill Industry. All this elegance and sophistication is completely customized to your needs. Custom Grilling Island have limitless combination's of designs, colors and finishes, there is a grill entertainment center that is perfect for your yard, we like to call it the "home resort". Are you planning an entirely self-sufficient outdoor kitchen? If so, you'll need to choose a location with both running water and electricity for cooking and refrigeration purposes, this will permit you to run basic appliances and refrigeration units. Consider having enough light over the counter tops and the working surfaces. Plan to have enough working space and arrange everything in a convenient way. You should have easy and direct access to both the sink and the grill to maximize your efficiency and comfort. How many cabinets or drawers are you going to need for storage purposes? How do you plan to shape the counter tops and the storage units located underneath? Do you want to enjoy family-style cooking? If so, consider the placement of the sink on the end of the counter top. This allows people to use the running water without bumping into each other. Placing a mini-fridge in the corner can also help. Granite and marble are two standard options for clean and sophisticated counter tops. Stone decorations give the kitchen a rustic appeal and a lot of character. At The BBQ Depot, we take this stuff seriously. We're passionate about our own outdoor living environments, and we have pretty high standards of quality. That's why you'll only find the most reliable, affordable and practical outdoor essentials on our website and in our showrooms. Take your time, browse each selection, and find all the missing pieces to your backyard puzzle. If you're near Hollywood, FL, be sure to visit us. If you really want to take things to the next level, be sure to stock up on some other great outdoor essentials, like grills and fire pits. We have everything you need, in stock and ready to ship. A quality outdoor kitchen can take your home to the next level. From sinks and refrigerators, to islands and outdoor cooking needs, we have it all. How are we Outdoor Kitchen experts?